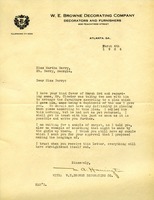 A letter to Martha Berry from M. A. Harrington discussing material that Berry requested. 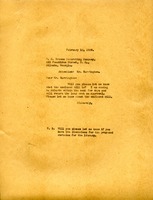 Martha inquires what the enclosed bill, and says she will be in Atlanta and will return the lamp sent. She also post scripts asking if the dimensions are ready for the library curtains. 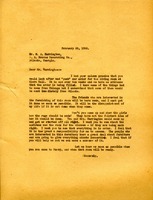 Mr. Harrington writes to Martha about a piano that Mr. Phillips thought would look loving on the Girl's Dining room balcony. Mr. Phillips is willing to drop the price of the piano if paid in cash. 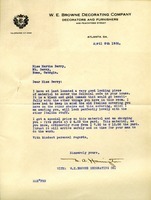 Mr. Harrington writes to inform Martha Berry that her wire was received and they have replied via parcel post. 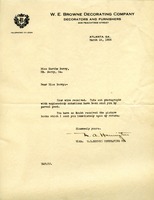 He also assumes that she received the picture books he sent. 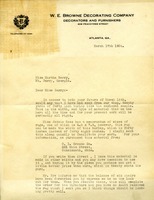 A letter to Martha Berry discussing burlap, carpeting and chairs that she had ordered from M. A. Harington. 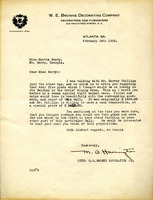 Harrington also discusses that she will be coming to visit and wishes to see Miss Berry.